A bartender prepares a cocktail. 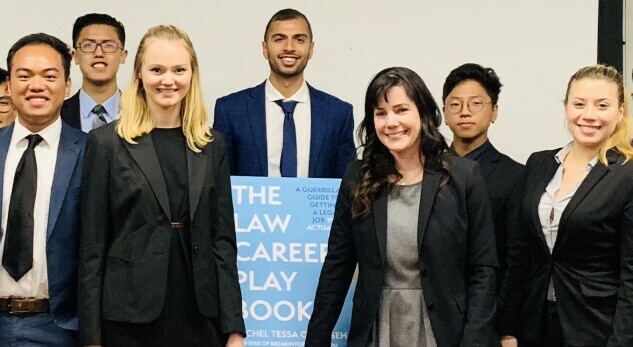 Big Law would benefit from communicating more with law students and attorney applicants so that they clearly understand the job before joining, Rachel Gezerseh, of Liang Ly LLP in Los Angeles, says. Firms should stop relying on their websites and cocktail hours as their primary method of recruitment and offer instead more one-on-one outreach with recruits. Big Law offers attorneys a pathway to the pinnacle of success in the legal field. Sometimes that success is found within Big Law itself, such as partnership, being lead trial counsel on a high-profile trial, or just being the best at our craft in our chosen profession. Sometimes that success is found outside the firm, such as in public service or helping a corporation (be it a Fortune 100 company or a startup) navigate the complex contours of the legal landscape. Whatever may be your ultimate calling, Big Law offers attorneys a pathway to that success and fulfillment. For all that it gives, a career in Big Law can be equally demanding. Dedication. Hard work. Sacrifice. But what does it mean to be dedicated, to work hard, and to sacrifice in a career in Big Law? Firms can and should do more to do more to communicate with law students and attorney applicants so they clearly understand the job before they join. And it begins with demystifying what it takes to break into Big Law while arming students with tools to make informed decisions about jobs that match their personalities, needs, and goals. Rachel Gezerseh meets with Phi Alpha Delta students at UCLA. So what can law firms do differently to differentiate themselves and attract talent that is a good fit for the firm? Throughout my time in working in Big Law, researching for and writing my book The Law Career Playbook, and mentoring hundreds of students, I’ve found it is imperative that firms do more to communicate what it means to succeed in our chosen field to attorneys, both aspiring and seasoned. This includes working to connect better with attorneys of all levels so they can better understand the profession and the job for which they are applying—a highly demanding job, but equally satisfying so long as you go in with your eyes open. This process begins with more support for one-on-one attorney outreach and student mentoring. As a long-term pipeline building strategy, firms should consider encouraging associates and partners to spend more time with potential recruits. I hear all the time from my law student mentees that they cannot differentiate law firms from their websites, which all tend to look alike. Are All Firms the Same? Aspiring lawyers, like Sara, all want to know what it’s really like to work in Big Law, including the reality of hours, what work actually involves, and what advancement opportunities exist. But they won’t be able get meaningful answers from words posted on a website. It takes a personal touch, a real conversation. My experience is that people—yes, lawyers are people too—generally have a desire to help, and to pay it forward. They just need to be shown how. And firms could and should spend time training their attorneys on how to engage with these aspiring lawyers, how to mentor and guide them. It will build a stronger bond between the existing lawyer and the new recruit. This will lead to long-term positive outcomes, including better retention and greater job satisfaction. Meet-and-greets and receptions alone are not enough. The reason is hidden in plain sight. People are shy (again, lawyers are really just normal people); and talking with strangers (especially those that a student looks up to) is really difficult. Few are born with the innate ability to network. Standard meet-and-greets and cocktail receptions should be the first step in introducing lawyers from the firm and aspiring attorneys so they can develop a one-on-one mentorship relationship. And firms should encourage their attorneys to do this frequently and provide guidance on how. Students looking to make informed career decisions will benefit from this increased personal interaction, and firms will benefit from meaningful connections with recruits by identifying with better precision those candidates that suit that firm’s unique culture. I was told by another student over winter break 2018 that receptions were scheduled on the same day and time, putting students at a disadvantage. “We have to pick and choose between the firms that we know very little about and end up missing out on opportunities to get to know more of them,” the student said. This can be avoided. By adding a personal touch, firms can dispel the fog that exists over recruitment and illuminate the path so their recruits can see the future for which they dedicate their professional lives is worth the sacrifice and hard-work. So how can Big Law accomplish this? It could mean providing in-office workshops for students, offering mock interview support, tasking firm lawyers to help students fine tune their resumes and cover letters for Big Law submission, or even shadowing opportunities for law students to give a real look at a firm lawyer’s day-in-the-life. Of top priority should be reaching out to students who participate in college and law school affinity groups, either those based on race, gender, or sexual orientation, or those with specific interests, like business, entertainment law, or a legal fraternity, like Phi Alpha Delta, one of my personal favorites. If a firm shows interest by sending its lawyers to speak at group meetings or hosting events for the group, that goes a long way in positively branding the firm in the minds of the students. Typically, these groups are active and passionate, qualities that any firm should be looking for in potential recruits. Ultimately, firms need to demystify what it is really like to work in Big Law. Firms should take steps to pull back the curtain and let students see inside. Given these opportunities, students will be better prepared to make decisions, leading to firms recruiting lawyers who aren’t just talented and intelligent—but the best fit for their firms, too. Rachel Gezerseh is the author of the upcoming book, The Law Career Playbook, and a partner at boutique law firm Liang Ly LLP, where she focuses on complex commercial litigation in federal and state courts. Previously, she spent a decade as a business litigator for Jones Day in Los Angeles. She is the creator of the Break Into BigLaw blog and recently joined the faculty at the University of Southern California as an adjunct law professor.